Today, Fox News is one of the most influential television networks in the world, certainly in the United States. Its influence and reach have grown so big that it will be spoken of in years to come in history books. Fox News and other conglomerates like it, such as The Wall Street Journal and The Times are the media toys of Rupert Murdoch, an Australian media mogul who has built a net worth of over $18 billion through his investments in the media. Both as a man who has helped shape history and as one of America’s wealthiest men, his name will go down in history as a man of considerable stature. Learn more about him and his life below. A fact which not many know due to the locality of his biggest assets in America is that Rupert Murdoch was born in Australia and for a long time was an Australian. He was born to parents, Dame Elisabeth Murdoch and Sir Keith Murdoch on the 11th of March 1931, in Melbourne, Australia. Although the world over knows him as Rupert Murdoch, his birth name is Keith Rupert Murdoch, named after his father. He was raised alongside three other siblings, Jane Calvert-Jones, Anne Kantor and Helen Handbury. The popular disposition about billionaires is that they were able to build such enormous wealth with the help of their parents. While that is not true for a sizable number of billionaires, there are a few for whom the sentiment is truer than with Rupert Murdoch who got his start in the media business after he was handed control of his father’s media company, News Limited. Before he returned to build the family business, Murdoch had gone through the journey of formal education, attending Worcester College in Oxford after graduating from Geelong Grammar School. While at Worcester, he studied Philosophy, Politics, and Economics. As the son of a journalist, journalism and the print media were second nature to Rupert Murdoch and it began to manifest right from his secondary school days when he became a co-editor for the school’s official journal. He continued at Worcester, where he was the manager of the Oxford Student Publications Limited. After his bachelor’s degree program at Worcester, he returned to his family’s business, News Limited shortly after his father’s death. Rupert Murdoch, who was 21 at the time achieved enormous success at the helm of his father’s business. Through the growing success of the company’s leading newspaper, The News, Murdoch began the acquisition of other media platforms and the building of a media empire. As he turned failing newspapers and publications into moneymakers in Australia, he began to expand his reach beyond the country into countries such as the United States and the United Kingdom. In the UK, he bought newspapers, News of the World and The Sun. The company later acquired The Times in 1981 and was also the owner of BSkyB, which are the owners of Sky Television in the United Kingdom. His foray into the United States in 1981 necessitated him to renounce his Australian citizenship in order to become a US citizen and invest in US television ownership. He later bought Twentieth Century Fox in 1985, HarperCollins in 1989 and the popular Wall Street Journal in 2007. He expanded to other continents such as Europe and Asia and by the year 2000, his company owned over 800 other companies in over 50 countries. The level of influence his media properties have garnered and bequeathed him, made him an important figure in a majority of the major countries in the world, including world powers such as Britain and the US. Although he is no longer a legal citizen, he is still a prominent figure in his home country, Australia and has been the subject of political controversies in various countries. Rupert Murdoch’s first attempt at a marital life was with Patricia Booker in 1956. He was married to her from 1956 to 1967 and the marriage produced one child, Prudence. His second marriage, in 1967 was to Anna Maria Torv, who is a journalist and a celebrated writer, which so far, is his longest as it ended in 1999, producing three children, Elisabeth, Lachlan, and James Murdoch. His third marriage was to Wendi Deng in 1999 and he was with her until 2013, the marriage produced two children – Grace and Chloe. He is presently married to his fourth wife, Jerry Hall, who he married in 2016. Several of his children hold one post or the other in his various companies. His oldest son, James Murdoch is the Chief executive of British Sky Broadcasting. 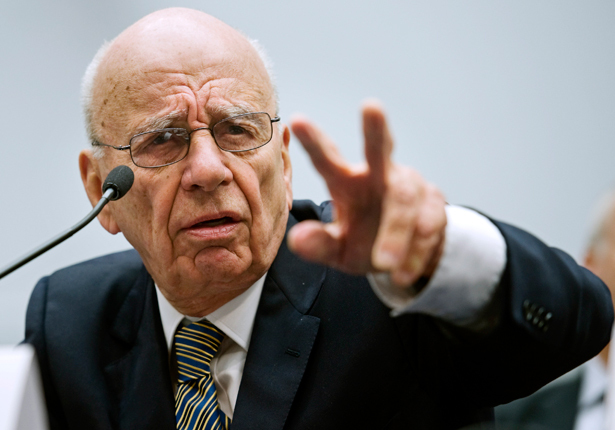 As a result of having six children, Rupert Murdoch is currently a grandfather of thirteen. Rupert Murdoch’s life building and selling media properties has helped him to a personal net worth of $18.1 billion as estimated by Forbes magazine. The sizeable net worth comes off the back of ownership of hundreds of media companies. Most of these companies fall under two major umbrellas which are the 21st Century Fox and News Corporation. Read Also: Warren Buffett Net Worth, Wife, Children, House, Cars, How Did He Make His Money? Some of the companies under 21st Century Fox include Fox News, National Geographic U.S., Twentieth Century Fox Film, BSkyB (U.K.), Tata Sky, FOX Broadcasting Company, etc. Those under News Corporation include Wall Street Journal, Dow Jones Private Market, The Daily Telegraph, Herald Sun, New York Post, Digital Real Estate Services, HarperCollins, etc.